These Farm Heroes level 544 cheats and tips will help you beat level 544 of Farm Heroes. 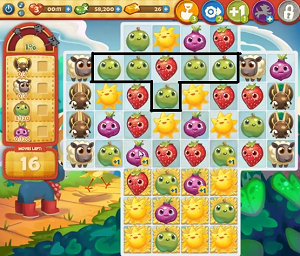 The objective of Farm Heroes level 544 is to collect 4 lightning bugs, 4 sheep, 120 green apples, and 120 purple onions in 18 moves. Level 544 Cheat #1: Make 5 of a kind matches and T matches. Since you need to collect 120 apples and 120 onions, you’re only going to be able to do it by making long combos. 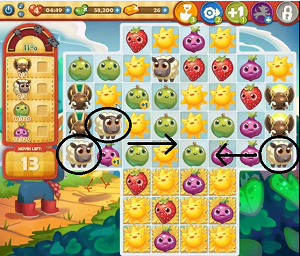 Level 544 Cheat #2: Always look for ways to move your sheep to the center. For the first half of the moves, you should be mainly making moves in the top center of the board. 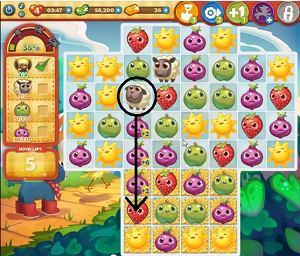 Level 544 Cheat #3: Drop the sheep to the bottom when you have an opportunity.